BigOption makes use of the the latest version of the SpotOption powered trading platform. This second generation platform is easy to use and offers advanced trading features such as the “Profollow” mode which allows traders to set their trading parameters to emulate the strategies of winning traders. This revolutionary feature is supported only by the SpotOption powered trading platform. BigOption also provides support for mobile trading. Traders can download the mobile app from Apple AppStore or Google Play. Another feature of BigOption is the Auto Trading robot which uses the Faunus Analytics technology and helps traders save time while trading. The SpotOption powered platform offers unique features like Roll Forward, Double Up, and Buy Me out. Newer features include the “Ladder” trading mode which enables traders to implement the advanced ladder trading technique with a single mouse click. Another standout functionality is the “ProFollow” trading mode which is a social media trading feature. Most account types will give you access to BigOption Academy that contains lots of useful training materials that will let you become a better trader and maximize your investment efficiency. You can also take advantage of an Islamic account that was prepared specially for traders who follow the Islamic faith. It is important to keep in mind that almost no service in the Binary Options Brokers category is a perfect solution able to meet all the needs of various investors. It may be a good idea to read a few BigOption reviews first as some solutions might actually excel just in a specific geography or situation or be designed with a very specific customer in mind. Others can operate with a goal of being easy and intuitive and as a result lack complicated functionalities needed by more experienced users. You can also come across services that focus on a broad group of users and provide a powerful feature set, but that usually comes at a more significant cost of such a software. Be certain that you're aware of your requirements so that you purchase a service that provides exactly the features you search for. 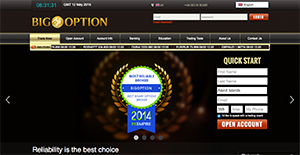 We realize that when you make a decision to buy Binary Options Brokers it’s important not only to see how experts evaluate it in their reviews, but also to find out if the real people and companies that buy it are actually satisfied with the product. That’s why we’ve created our behavior-based Customer Satisfaction Algorithm™ that gathers customer reviews, comments and BigOption reviews across a wide range of social media sites. The data is then presented in an easy to digest form showing how many people had positive and negative experience with BigOption. With that information at hand you should be equipped to make an informed buying decision that you won’t regret. What Bonus Does BigOption Offer? If you need more information about BigOption or you simply have a question let us know what you need and we’ll forward your request directly to the vendor.